Friday Grab Bag: Patrick Stuart, Épées & Sorcellerie, B/X Essentials, Lasers & Feelings Hacks, Etc. Some Lamentation of the Flame Princess goodies, thoughts on layout and PWYW, my love for Épées & Sorcellerie and anticipation for B/X Essentials. There are free maps and story games, too. And other stuff. It's a short read, check it out. Bookkeeping Notes: Some of the links below are affiliate links, which means that if you choose to make a purchase, I will earn a commission. This commission comes at no additional cost to you. Please do not spend any money on these products unless you feel you need them. James Raggi, Zak Smith, and Patrick Stuart talk about Lamentations of the Flame Princess, Ennie Awards, and the success of Veins of the Earth, Red and Pleasant Land, Blood in the Chocolate. 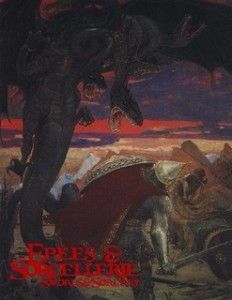 I recently re-read Épées & Sorcellerie by Nicolas Dessaux, a Chainmail-based old school game. I appreciate the fresh ideas and the exclusive use of six-sided dice. An underappreciated gem for sure. It oozes old school but is an original game, not a retro clone. Jens D. has a well-written review. And Gerard Nerval did a solo play of E&S. The first edition is available in English as a free PDF. The second edition is in French. Luckily, the core mechanics haven't changed, so the first edition is still a solid game. Gerard has begun translating the additions from 2e into English. The B/X Essentials project is a reorganized, simplified expression of the classic Basic/Expert rules, with the focus on ease of reference at the table. There are games like Labyrinth Lord or Basic Fantasy that use the original Moldvay/Cook iterations of D&D as a base. But they also make rules changes. B/X Essentials stays faithful to the source but rearranges and clarifies the text. Some ideas on Yes, But... by John Stater. An interesting article as it isn't about story gaming but adventure design. Finally developed a world building method that appeals to my love of hexagons and straight lines. A free pack of 85+ map assets, examples here. Karl Stjernberg made some interesting Die Drop Tables here and here. Patrick Stuart looks at Aspects of the 'Texas'-Style Layout in Hot Springs Island. Should we do Pay-What-You-Want for our products? Here are two discussions of interest on G+: When does a PWYW model make sense? and Brad Murray's take on PWYW. Here are some free Micro Games collected by Bruno Bord. There is a Breton hack of Lasers & Feelings by Aleksandr Ermakov. And if you want to have more of that, check out Matthew Schmeer's Lasers & Feelings & Assorted L&F Mods. There is an new Dungeon World Newsletter #11. Corpseglade looks hawt. I'm working on two articles. Blood and Bone ("Game of Thrones meets Dungeons and Dragons") and Exodus System SRD (OSR game based on Black Hack, Cortex Prime, Numenera/Cypher System and the Adventurer, Conqueror, King System (ACKS)).